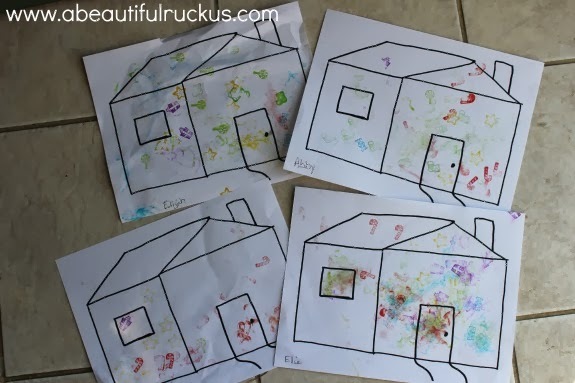 A Beautiful Ruckus: Stamped Gingerbread House for Toddlers + Free Printable! 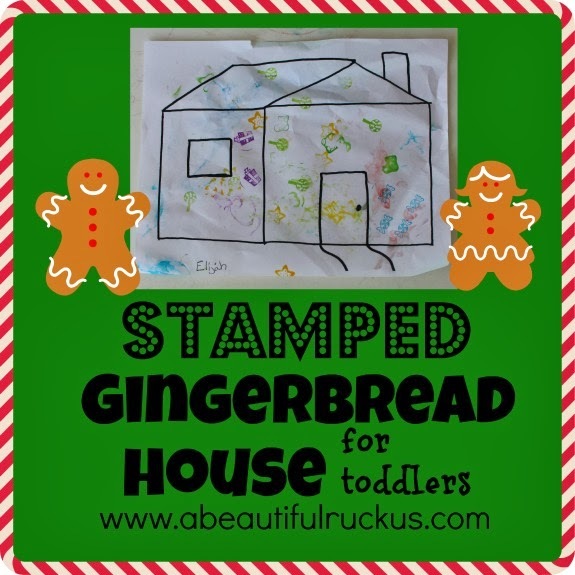 Stamped Gingerbread House for Toddlers + Free Printable! Although we are still solidifying the part where you don't eat crayons or color on the walls, I wanted to try a new skill this week. I decided to introduce the concept of stamping! I bought some very inexpensive Christmas Sweet Treat Stampers from Oriental Trading Company. For about $5, I scored a set of six stamps for each kid. Then I drew a nifty little gingerbread house for us to use our stamps on. With Christmas around the corner, making Stamped Gingerbread Houses seemed quite appropriate! After awhile, we started doing a little chant, "on the paper!" every time they tried to stamp. The ink seemed to be traveling a little bit, and encouraging the stamping on the paper seemed to help them remember what they were supposed to do. They also thought it was fun to say that every time they added a new piece of candy to their house. Hey, if turning it into a game is helpful, I'm all for it! I also liked that the stamps were all self-contained. Since they each had a lid, the kids practiced snapping them on and off every time they picked up a new stamp. 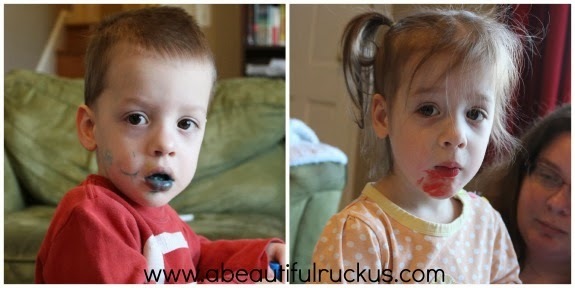 Hopefully dried out stamps and markers can be avoided in our future! At the end of our project, we ended up with gingerbread houses that looked....well, not much like gingerbread houses. Lol! 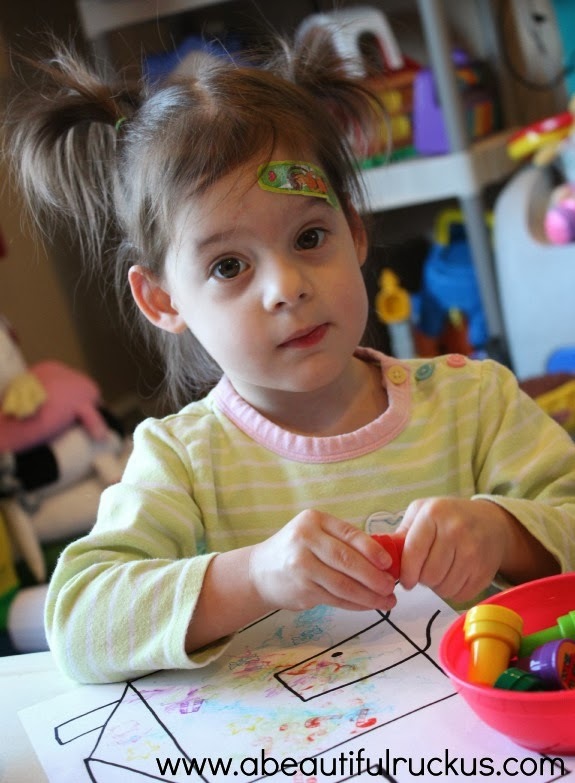 But the kids had a blast stamping candy canes and wrapped candies all over their houses and exploring how stamps work. I'd call it a resounding success and proudly display them for guests to see! 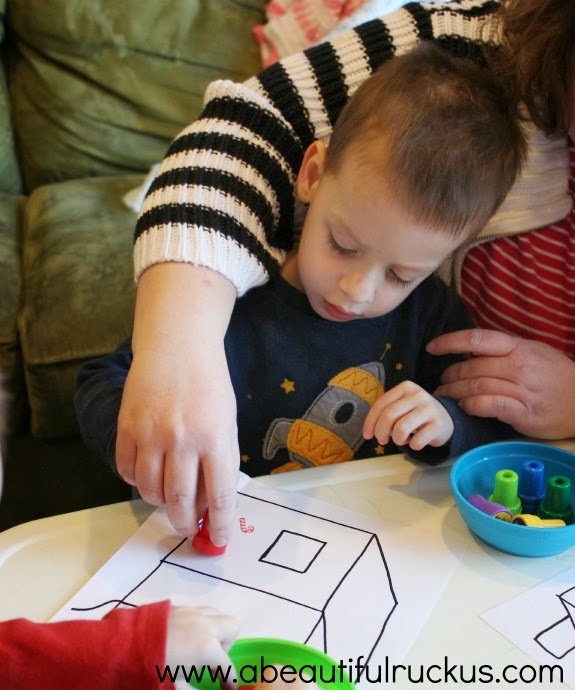 If you would like to print a copy of our blank Gingerbread House for your own toddler stamping or coloring project, you are welcome to do so! Have fun! Awww, that is too cute! I wonder why kids like stamps so much? It's universally fun. I can almost hear them saying, "On the paper! On the paper!" This is my kind of gingerbread house - the kind that doesn't fall apart just when you think it's dried! lol! 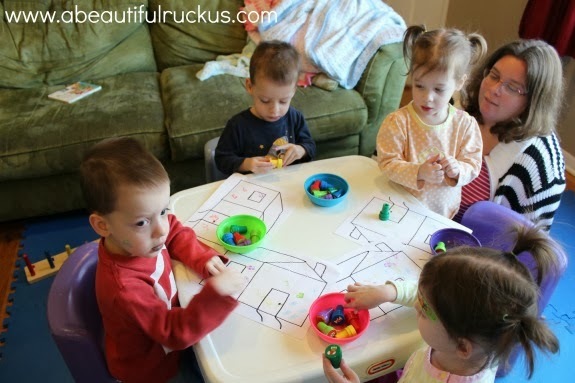 this looks like a fun snow day activity for my girls. they love gingerbread houses, and we usually have an actual gingerbread house - but they got so much Halloween candy this year there is still some left!! So I decided we didn't need the extra sweets. And this looks much easier to do than applying icing on gingerbread walls!